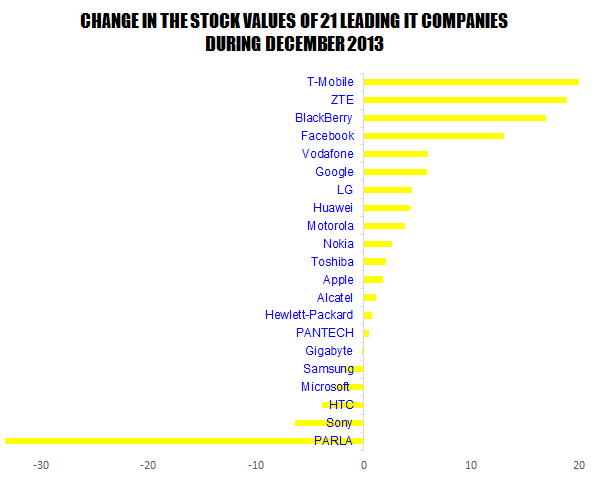 Stock of 21 leading IT companies went through ‘2.567%’ mean change during the month of December 2013. As a whole, it was a good month for the 15 companies whose stock values increased and was an unfortunate month for the remaining 6 IT companies whose stock lost its value. Highest change ‘19.976%’ was noted in the stock of T-Mobile with ZTE secured the 2nd highest change of ‘18.919%’ in the stock. Stock of BlackBerry had the third highest change of ‘16.962%’ in its stock. Lowest change was noted in the stock of PARLA which changed by ‘-33.333%’. As a whole it was a very good month for the IT companies. How Badly BrExit Hit the Global Stock Markets on June 24 & 25? How to Change Landscape Orientation to Portrait in Microsoft Windows 10? How to Change Wallpapers in Microsoft Next Lock Screen for Android? How to Change Color of Image Border in Android 4.4.4 KitKat Device? Is Microsoft Going to Dominate, Android, iPhone and even Stock Market? Alan Mulallay’s Refusal to Lead Microsoft, Led MSFT to Red Day?